(Boston, MA) I enjoy myself most with adaptations of Shakespeare’s comedies when their sense of fun and lightness remain intact. 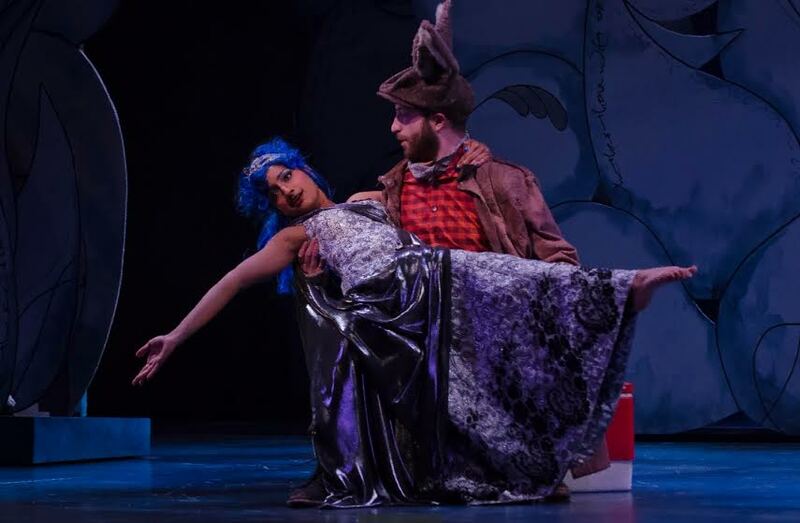 The direction in Boston University Theatre’s production of Benjamin Britten’s A Midsummer Night’s Dream didn’t fail me. This vision is every bit the dream of the title. Fairies wear blue wigs and polka dot suits, columns of giant, white flowers are moved across the stage, Puck (Elizabeth Valenti) brings Queen Tytania (Maya Kherani) her morning tea, and King Oberon (Wee-Kiat Chia) smugly points out his wife slept with an enchanted donkey-man (Joseph Hubbard) the night before. One scene flows into the next elegantly. For the most part, it’s a perfectly realized vision. Britten’s 1960 adaptation may throw some with its discord and strongly characterized tones. Lyrics taken straight from the Elizabethan text seldom rhyme. It was an adjustment, but one I was all too pleased to make. A playful, slippery, Modern score suits the story, divided between comically feuding lovers on the run from arranged marriages in Athens, the king and queen of Fairyland fighting over a stolen child, and the misadventures of an acting troop. It’s an opera faithful to the spirit of its material, longer than a musical but not interminable. Some would call requiring two intermissions punishing it. But no, this is an immersive experience. Maya Kherani is a divine Tytania, just a perfect fit. Her presence is powerful and glamorous, a titan among the fairies. Wee-Kiat Chia is suitably creepy and cunning as her husband. Joseph Hubbard’s turn as the idiotic Bottom, a pawn in Oberon’s scheme, is inspired and cheerfully vain. It was a true pleasure watching them. The human characters are also fantastic. Helena (Tara Deieso) is perfectly cast as the spurned love of Demetrius (John Allen Nelson), clinging to him desperately, stubbornly, ridiculously. Hermia (Alexandra Rodrick) goes from a pillbox-hat-wearing Jackie Onassis to a bare knuckle brawler when an enchanted Lysander (Jesse Darden) leaves her to pursue skeptical Helena. The foursome’s slapstick fight is a wonderful highlight. Theseus (Isaac Kim) and Hippolyta (Te Hu), however, aren’t given much chance to shine. What didn’t work for me was Puck. I’m confused what both the director and actress were going for. The character, who usually glues one storyline to the next, feels like she’s entirely separate from the action. Maybe it’s the fact she speaks her lines rather than singing them or that she’s dressed in a fez and moustache in contrast to Oberon and Tytania’s regal costumes. It makes sense she would be an outsider to the action, as she takes up the mantle of narrator by the end, but there’s no balance between her turn as the lighthearted trickster and the vulnerable slave to Oberon. She feels like a combination of too many artistic visions rather than just one. And the main artistic vision is wonderfully realized. Whatever its faults, this is an opera worth remembering. The music is beautiful and the action well-paced. Before the end, the flower columns part to reveal the stained glass window of a church in a similar pattern. It’s like stepping inside a real dream, one in which I was happy to vanish. UPDATE: This review was originally posted with incorrect vocalist credits. These have been updated. This entry was posted in Musicals and Opera and tagged 1960, 2016, A Midsummer Night’s Dream, Alexandra Rodrick, April, Benjamin Britten, Benjamin C. Taylor, Boston, Boston University College of Fine Arts, Boston University Theatre, Elizabeth Valenti, Emily Spencer, Gillian Daniels, Hellen Hassinger, Isaac Kim, Jesse Darden, John Allen Nelson, John David Nevergall, Joseph Hubbard, MA, Maya Kherani, Oberon, opera, Peter Pears, Puck, Shakespeare, Tara Deieso, Tara Faircloth, Te Hu, Tytania, Wee-Kiat Chia, William Lumpkin by gilliandaniels. Bookmark the permalink.